I am feeling too lazy to write a full-length review post of the movie, Arjun - The Warrior Prince, the first animation movie by Walt Disney in India, and produced by UTV. The movie released on 25 May 2012, and got mostly 3 stars (out of 5). I watched the movie on the 27th of May, and well, despite very good quality graphics and animation, the movie itself falls far short of what could have been a great animation movie of an ancient epic and heroic character. I rattled off a dozen or so tweets on my timeline, and am reproducing them here as a sort of a review of the movie. 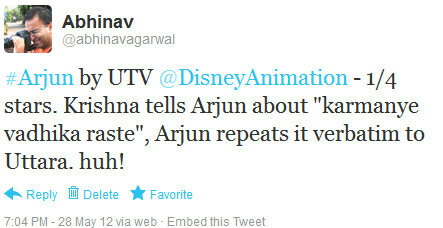 #Arjun by UTV @DisneyAnimation - 1/4 stars. Howlers!!! 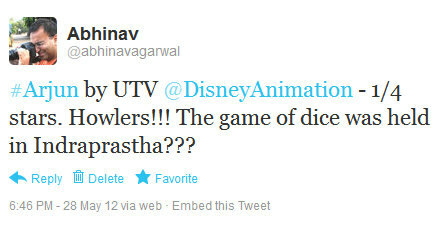 The game of dice was held in Indraprastha??? 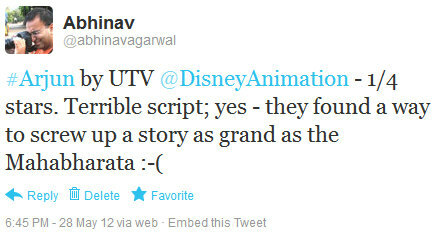 #Arjun by UTV @DisneyAnimation - 1/4 stars. Drona makes a habit of kicking his students. 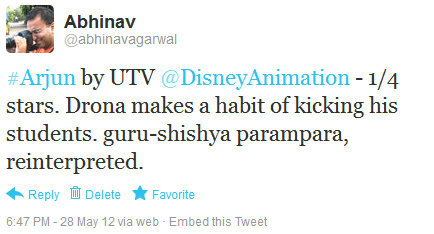 guru-shishya parampara, reinterpreted. #Arjun by UTV @DisneyAnimation - 1/4 stars. 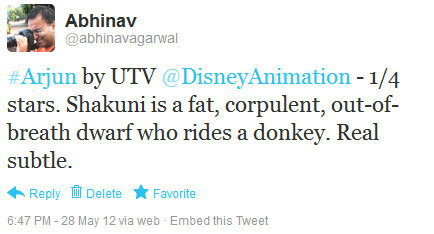 Shakuni is a fat, corpulent, out-of-breath dwarf who rides a donkey. Real subtle. #Arjun by UTV @DisneyAnimation - 1/4 stars. Dhritarashtra a bald dwarf. Sigh. #Arjun by UTV @DisneyAnimation - 1/4 stars. 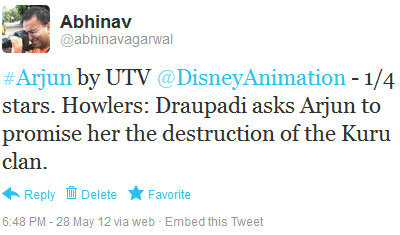 Howlers: Draupadi asks Arjun to promise her the destruction of the Kuru clan. 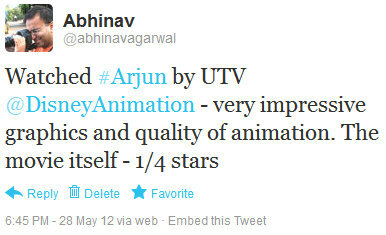 #Arjun by UTV @DisneyAnimation - 1/4 stars. 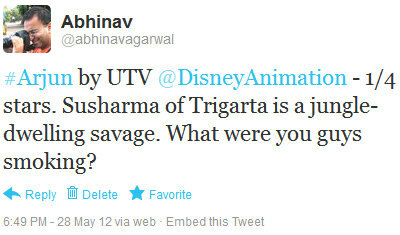 Susharma of Trigarta is a jungle-dwelling savage. What were you guys smoking? #Arjun by UTV @DisneyAnimation - 1/4 stars. 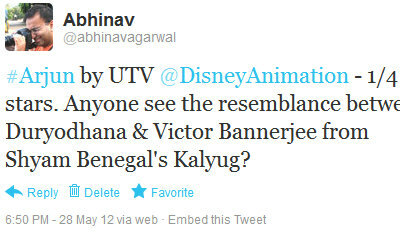 Anyone see the resemblance between Duryodhana & Victor Bannerjee from Shyam Benegal's Kalyug? #Arjun by UTV @DisneyAnimation - 1/4 stars. 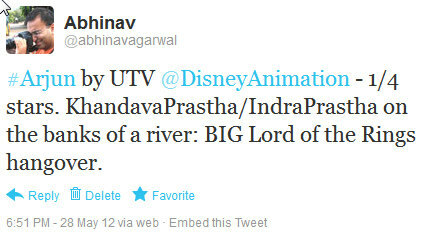 KhandavaPrastha/IndraPrastha on the banks of a river: BIG Lord of the Rings hangover. #Arjun by UTV @DisneyAnimation - 1/4 stars. 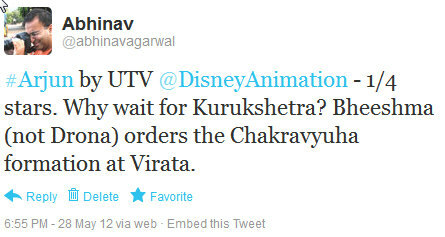 Why wait for Kurukshetra? Bheeshma (not Drona) orders the Chakravyuha formation at Virata. #Arjun by UTV @DisneyAnimation - 1/4 stars. 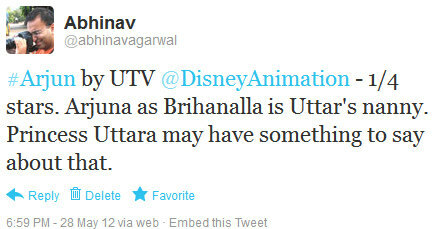 Arjuna as Brihanalla is Uttar's nanny. Princess Uttara may have something to say about that. #Arjun by UTV @DisneyAnimation - 1/4 stars. Krishna tells Arjun about "karmanye vadhika raste", Arjun repeats it verbatim to Uttara. huh! #Arjun by UTV @DisneyAnimation - 1/4 stars. 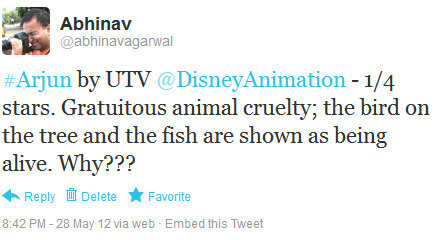 Gratuitous animal cruelty; the bird on the tree and the fish are shown as being alive. Why??? #Arjun by UTV @DisneyAnimation - wonder whether the exaggerated caricatures from the Mahabharata are not meant for the western palate. Pity.